A new exhibition at the Getty Center in Los Angeles dovetails perfectly with real-life events. News – real and fake – has drawn great scrutiny this election year. But, many artists have taken hard looks at broadcast and print journalism in the past. These efforts are presented in the J. Paul Getty Museum’s “Breaking News: Turning the Lens on Mass Media” exhibit, which opened this week. The Getty show explores how 17 artists have looked at and commented, via their work, on news images. The topics start with the Vietnam War in the 1960s and ending with the so-called “War on Terror” in the 2000s. The subject matter includes photographs, videos and collages, many of which are multi-part series. The museum is showing how artists interpret journalistic coverage of current events. Exhibit curator Arpad Kovacs, assistant curator of photographs at the Getty Museum, noted that “how images circulate and how the meaning can change depends on the context or how it is presented,” which the show tries to illustrate. One highlight of the exhibition is Omer Fast’s 2002 video piece “CNN Concatenated.” The Israeli-American artist’s video is a spliced collage from hundreds of newscast that aired between 2001 and 2002. There is brief footage of Wolf Blitzer, Larry King, Christiane Amanpour, and other on-air reporters delivering news about 9/11, the anthrax scare in Washington, D.C., and other headline-marking news. The video is also intended to visually parody the implied urgency of nonstop nature available on 24-hour news channels like CNN. Auditorily, it questions the information being presented. One features photos of politicians on evening newscasts arranged in abstract displays. The other features shots of newspaper pages, many of which announce fatalities, blown up dramatically. Martha Rosler’s series “House Beautiful: Bringing the War Home” uses glossy “LIFE” magazine images of American luxury juxtaposed with the suffering of Vietnamese civilians. Long before Photoshop, Rosler was pasting images from the conflict into seemingly perfect images of life stateside. The result shows the dissonance between the war and images delivered into American homes. Robert Heinecken’s work differs by not focusing on the content of the news. Rather, he focuses primarily on of the newscaster as a personality. There are several pieces here that feature newscasters, often in isolated bust-length views and arranged according to similar facial expressions, as them selves or morphed with copresenters. For example, one shows shots of Jane Pauley and Bryant Gumbal along with one that merges their features. The concept looks at the ideal newscaster. Some artists in the Getty exhibition examined the priorities or prejudices media give certain stories over others. For example, Chilean artist Alfredo Jaar has two series presented here. They look at American magazine covers, partly to see what they did feature, but more so what they did not – Africa. One display features some of the 17 covers from “Newsweek” magazine in 1994 that Jaar reviewed. The covers typically feature celebrity-related items of interest like O.J. Simpson’s arrest or the suicide of Kurt Cobain or other American-oriented features. 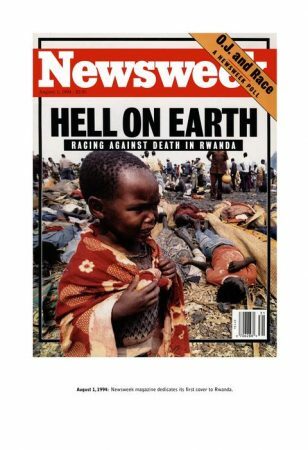 Only one from August has a cover story on the Rwandan genocide depicting a field of bodies with a headline declaring it, “Hell on Earth.” However, to illustrate the point that the magazine ignored the ongoing atrocities the other weeks, he added text below each cover detailed that week’s casualties in Rwanda. His second politically motivated series looks at “LIFE” magazine covers from 1936 through 1996. The 2,128 issues reviewed only included five on Africa, and they only featured the animals of the continent. In 60 years, there were no cover stories about the people, countries, economies, wars, famines, or other aspects of African life during the period. The most recent news items featured in the Getty exhibition look at the War on Terror. The concept for the contemporary work originated in a 1955 Bertolt Brecht book of press photographs “Kriegsfibel” (War Primer) from World War II presented along with four-line poems about the horror of war. In their 2011 update, “War Primer 2,” Adam Broomberg and Oliver Chanarin replaced the World War II images with recent ones, such as Saddam Hussein’s execution and torture scenes at Abu Ghraib prison. The Getty “Breaking News” exhibit that turns the lens and focuses visitors eyes on the mass media illustrates how the news shapes viewers’ realities and perceptions. The exhibit will be at the Getty Museum through April 30, 2017. 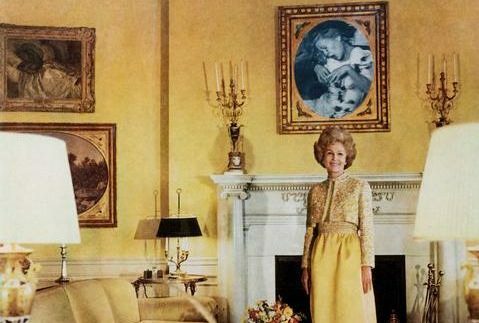 First Lady (Pat Nixon), from the series House Beautiful: Bringing the War Home, c. 1967–1972 © Martha Rosler, courtesy of the artist and Mitchell-Innes & Nash, and the Getty. Alfredo Jaar’s look at “Newsweek” covers courtesy Alfredo Jaar and Galerie Lelong, New York, and the Getty. One Response to "Getty Exhibit Turns Lens on Breaking News and Mass Media"